Oh, hey friends...it's good to be back! After a long weekend and the nasty sickness finally leaving our house, I'm finally getting a post up! Today is one of my favorite fall looks and these jeans are by far my new favorites! The perfect fit and distressed in all the right places- these Joes Jeans are the perfect destroyed boyfriend jean for fall. These and this comfy Good hYOUman sweater were both finds from the always lovely Blue Linen Boutique- my favorite St. George boutique! Make sure to check my instagram account today for a chance to win $100 gift card to Blue Linen Boutique!! Just go here and follow all the requirements- Good luck!! I've also been playing with a lot of fun braids lately and can't wait to show you all a few of my favorites! Your braid rocks! Such a darling outfit! I love the layering! 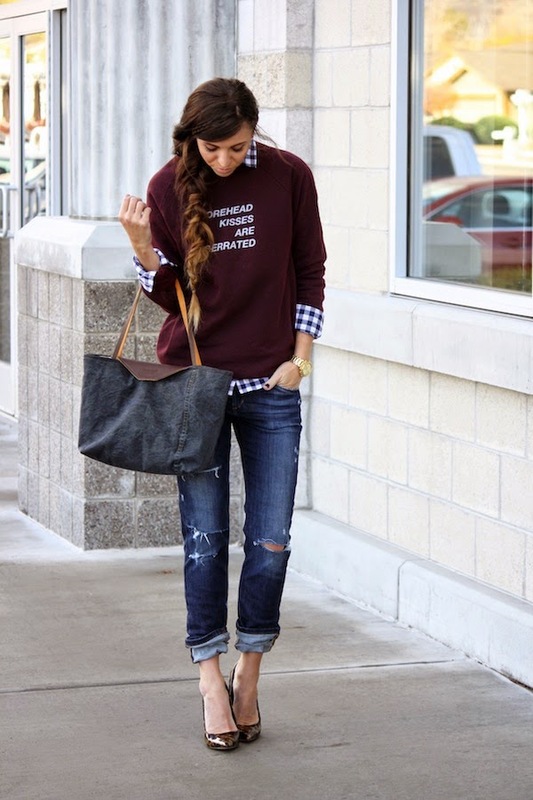 Love the jeans, the heels and obsessed over the tote! Your casual style is perfection. Those jeans are adorable! You look cute as always! I love everything about this look! Those jeans are perfect and I love the braid! Beautiful!